Could Property Management Companies Disappear? Speakers at vacation rental conference show concern. 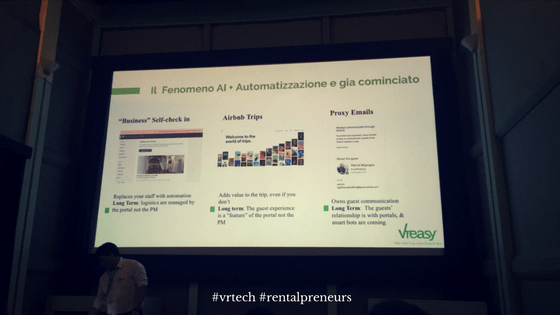 On June 8, I attended a VrTech (vacation rental technology) event in Rome. I was there to bring back industry education for my Booking.com Homes & Apartments team, as well as to push forward several deals with some companies present. Yet, I was quite amazed by how each and every speaker presentation seemed to imply that property managers were under threat. 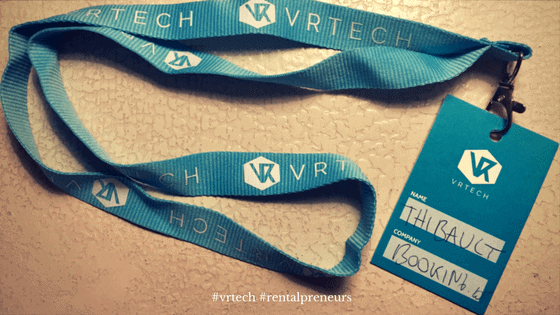 Just as I did for VrTech Paris 2016 french vacation rental companies, I am sharing here my notes with you. Let me know in the comment section below what you think. VrTech Rome was taking place in the wonderful gardens of the Villa Borghese. 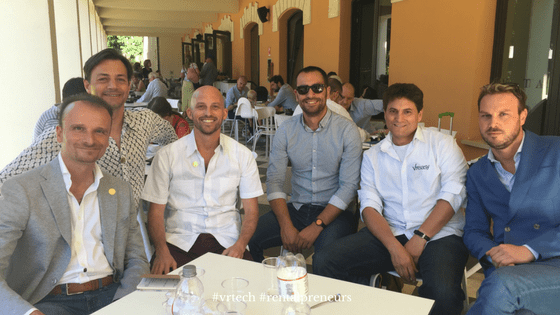 On this photo, I am hanging you with Antonio Bortoletti from the Vacation Rental World Summit (I will be speaking at the 2017 edition in Florence next September), Matt Landau from the Vacation Rental Marketing Blog, Martin Picard from VrEasy and Stefano Bettanin from the Italian association of property managers. 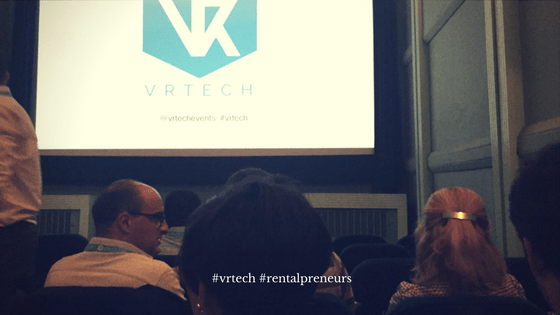 Update: I’ve got asked when the next VrTech event would be taking place: VrTech Edinburgh in on September 5 and VrTech Paris is on October 5 (I will be a speaker at the Paris one, on behalf of Booking.com). Recurring topic: Property management companies are threatened on several aspects of their value chain. This is clear from every presentation, from different perspectives. Rentals United made it plain that the industry was highly competitive and that VR property management companies needed to diversify away from just Airbnb, Booking and HomeAway. There are travel agents, wholesalers, vertical listing sites, etc. 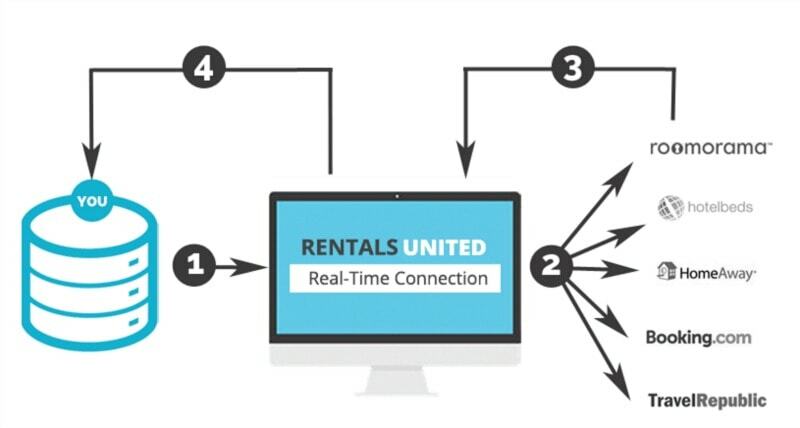 Yet, it is hard to keep up and integrate with everything, so a channel manager like Rentals United can help. Whenever I attend a conference, I realize how the notion of “channel manager” can be daunting for short-term stay owners and managers. Yet, I’ve using one very simple yet efficient, BookingSync, for 3 years. For more information on what a channel manager does, you can refer to a guest post by Vanessa De Souza Lage where she explained how a channel management solution like Rentals United can help vacation rental businesses make more bookings. VREasy had a presentation called OTAs + Artificial Intelligence = Death of the property manager. Very interesting vision that we at Booking.com would not completely deny: OTAs may have won the booking war (i.e. Property managers cannot compete in PPC with OTAs) and now OTAs are going after guest experience. and now offering local experiences (e.g. Airbnb Experiences). Should the vision become true, the only thing left for property manager would be … cleaning the place! So, property managers have to fight to propose local experiences and monetize them (see slides above). Speaker Martin Picard thinks that OTAs cannot match local actors for local experiences and so have to double up on pre-selling experience before the guests arrive. And use branding to get them to rebook directly with them. Properly insisted that cleaning (again) is the real problem for the industry. One of his slides shows that property managers are « squeezed » between Platforms (OTAs) and Owners. So, a property manager has to reinvent its operations, which is a lot of cleaning give a unique experience and get great reviews. And fast cleaning is also a key to make the accommodation available faster. Interesting data: In Rome, cost of cleaning for a hotel room is € 8 – 12, while it is € 40 – 120 for a vacation rental (it is just bigger). So, saving on cleaning is key for property managers. This is of course where Alex’s app, Properly, can help property managers deliver a reliable cleaning experience, even with staff who do not know a specific vacation rental well. 80% of online bookings from OTAs. What other channels can you use? B2Book had data about the VR market. 1 slide can be scary for PMCs: 80% of online bookings for VR are recorded on either Airbnb, Booking, HomeAway or TripAdvisor. My own note: No data source was quoted for this slide here, so take this big fast number with a big grain of salt. 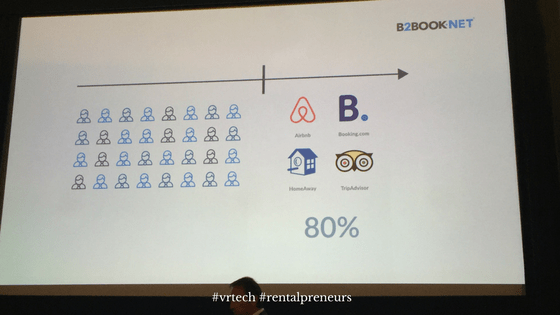 Yet, the fact that property managers are shown this kind of slide at a conference can only reinforce what VReasy suggested: Property management companies (may) have lost the booking war. So, B2Bbook’s credo is to get PMCs to diversify distribution by tapping B2B channels like Travel Agents. 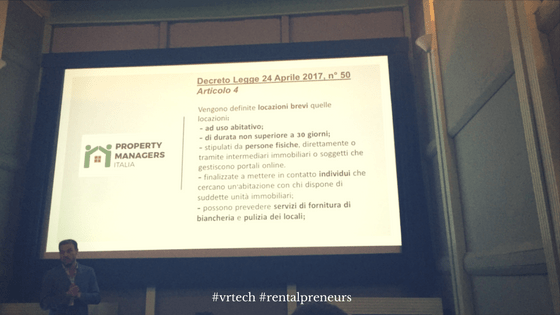 The Italian association of property managers was very clear that the new Italian law on vacation rentals is both vague and dangerous. Basically, property managers and Platforms would have to report, collect and pay revenue taxed on behalf of owners. I will not get into details here, our Italian team and Public Affairs are looking into it. The organizer, Vanessa Souza De Lage from Rentals United, told me that the real draw for the attendees had been the presence of Steffano. Unclear legal rules scares everyone. 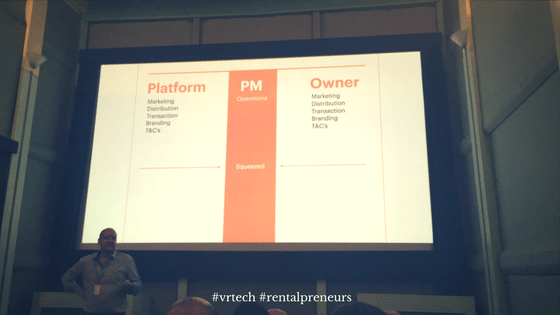 Matt Landau from the Vacation Rental Marketing Blog (VRMB), a great resource site for owners and managers. I had introduced you Matt in a previous blog past (Matt Landau; his Vacation Rental Marketing Blog and his Inner Circle). Although I’ve had emailed and skyped with Matt several times over the years, it was the first we had me in the flesh. He had to fly from Panama City and I from Amsterdam to finally meet up in Amsterdam. 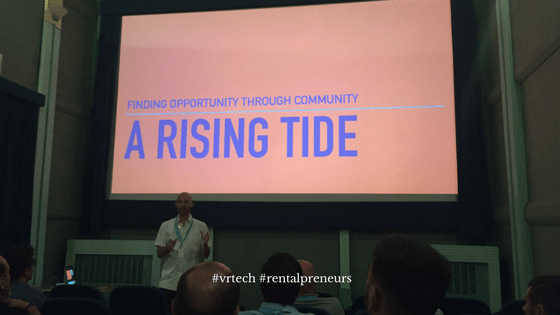 Matt’s message was about the virtue of community building: Vacation rentals bring a lot of good to local communities, for instance by letting visitors experience a local area and spend money at local stores. His message was also that event like VrTech or his Inner Circle are ways for short-term rental industry members like you and me to share, unite and make our cause move on. And you, what do you think? There is no denying that vacation rental managers are under pressure. Yet, do you share the perspectives set out by these speakers? How can property managers buck the tide and grow their revenues, brand and guest loyalty? Use the comment section below now to share your opinion with your fellow readers!